Pitchers learn and develop different pitches, and they do so at varying stages of their lives and careers. It might be a curveball in high school, a cutter in college, or a changeup in A-ball. Sometimes the addition or refinement is a natural progression — graduating from Pitching 101 to advanced course work — and often it’s a matter of necessity. In order to get hitters out as the quality of competition improves, a pitcher needs to optimize his repertoire. In this installment of the series, we’ll hear from three pitchers — Ray Black, Tanner Scott, and Matt Strahm— on how they learned and developed their sliders. “When I was in high school, I had the privilege of working with Andy Ashby, who is pretty much a legend around Wilkes-Barre. We messed around a little bit with a slider at the time, but I really started developing it more coming back from my Tommy John surgery. I blew out my senior year. “My curveball was too big, too loopy, and easy to distinguish. I think I was throwing it almost 20 mph slower than my fastball. When you’re younger, you see this big breaking ball, somebody is diving out of the way, and you’re like, ‘Man, that’s nasty.’ But when you get up to the higher levels, you realize it’s more deception; it’s not just movement. I tried to develop a slider like a cutter. That’s what I think when I throw my slider: cutter. If I don’t, I always end up trying to make it bigger than it should be. I need to try to keep it tight, keep it small. “It’s been a development pitch for me. I’ve kind of toyed with it a little bit over the years. Steve Kline is a guy who has helped me a lot with it. I worked with him in Augusta, my first year of Low-A  and then I was with him again in Richmond . He always messed around, throwing cutters to hitters during batting practice. I watched the way he held it, and kind of picked it up off of him. “I started working on a slider when I first got into pro ball. Before that I was curveball. But it wasn’t really a curveball; it just spun. When I was starting in Double-A, and doing three innings at a time, is when I really developed my slider. That’s when I really got the feel for it. “The grip I use is one that Alan Mills taught me. It’s very basic. My middle finger is a little off the seam. It’s on it so that I can feel it, but not on top of it. I’ve also learned to manipulate my slider. It’s about my release point with my fingers, how I finish the pitch. I can make it breaks two ways. One has more depth and the other is more side to side. “I wasn’t allowed to throw a breaking ball until I was 15 or 16 years old. My dad just wouldn’t let me. My slider is more recent. I’d been curveball, but Dave Eiland liked my arm action for a slider. Same thing when I got over here [from the Royals]. It plays off my fastball better. A curveball is a pitch that is going to go up out of my hand, and a slider is going to explode out of my hand. They’ve told me here that my fastball explodes out of my hand, so this gives me a pitch that is much like my fastball until the very end. “I started to develop it a little bit in Kansas City, but my knee injury in 2017 kind of put an end to that. Getting traded over here was a little blessing in disguise, to get with Balls [pitching coach Darren Balsley]. He kind of sharpened it up. He made it a legit swing-and-miss pitch for me. “Something that helped it click was A.J. Ellis explaining to me — this was last year — the term ‘kill slider.’ That really stuck with me. 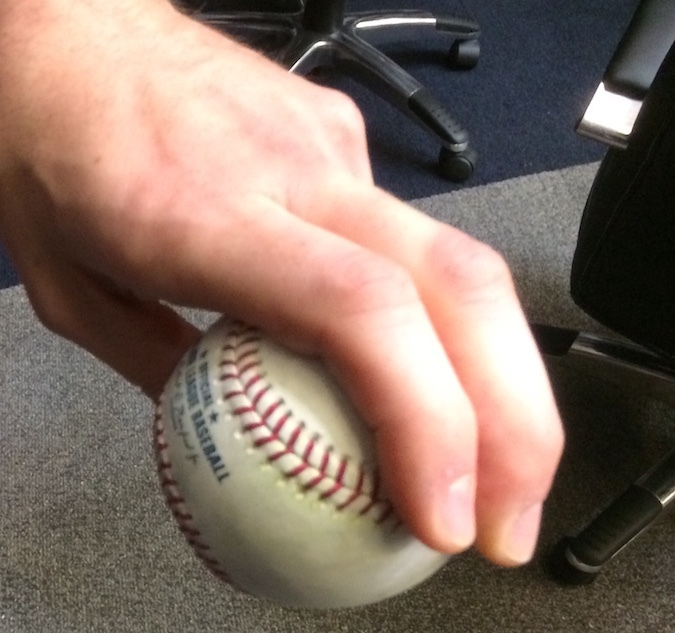 It helped me throw my slider as a swing-and-miss pitch, versus trying to place it somewhere. A.J. said to just throw the hell out of it, and I was like, ‘All right.’ I did, and ever since I’ve kind of had that feeling for it. I basically take my four-seam and rotate the baseball — maybe 25 degrees? — and let it rip. 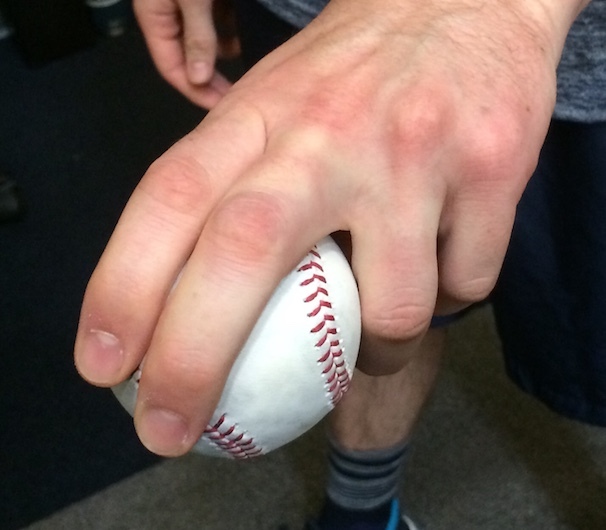 Matt Strahm’s slider grip, again. We hoped you liked reading Ray Black, Tanner Scott, and Matt Strahm on Learning and Developing Their Sliders by David Laurila!